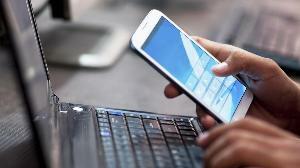 When it comes to building apps, it's more than just writing code. And unfortunately, many people (and companies) forget that. 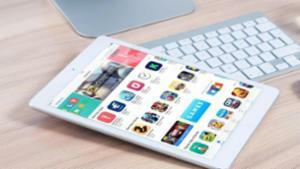 In fact, the raw time it takes to build the app itself is only half the battle. 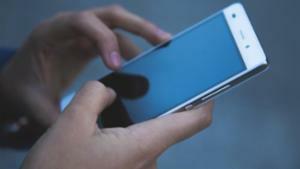 The narrative of smartphone revolution is incomplete without the mention of apps, for the latter is being used today for a variety of purposes. 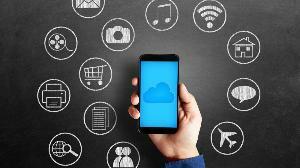 From booking hotel (or plane) tickets to ordering food to even conducting small businesses, mobiles apps are proving their utility day-in and day-out. Learn how to use the free Acronis True Image app to easily transfer data between iPhones and Android phones. 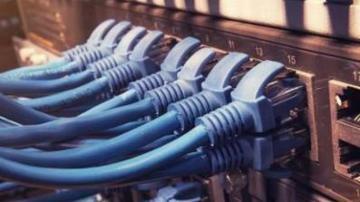 You should read OS supplied guidelines before developing. I can't stress that enough. 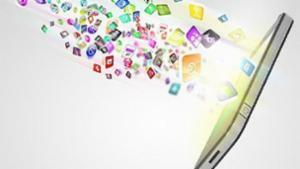 The guidelines will help you understand the reasons mobile app developers do what they do. Apple is very particular when they review appstore submissions. 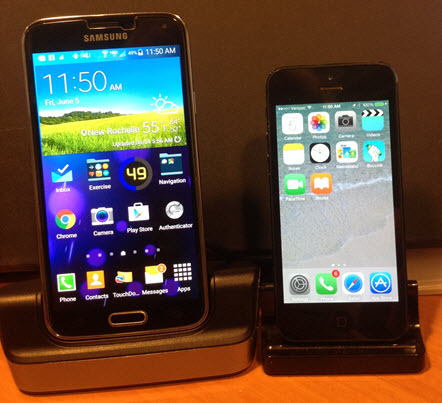 I recently asked a question about Computer Inventory applications for Mobile Devices. I was specifically interested in an app I could use on my android phone. 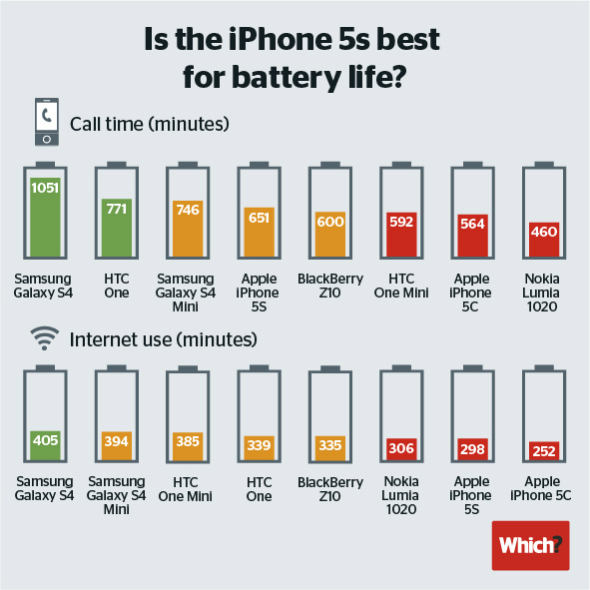 The best answer to that question was a recommendation from expert Fouad Maidine for 2 apps, one of them was infradog. I have used another app for several years called Computer Inventory (CI) from iMobile3, which is for iPad only and Here I was looking for an Android app. I also found an app called Cellica DB, which can be used to create the tracking forms I wanted. 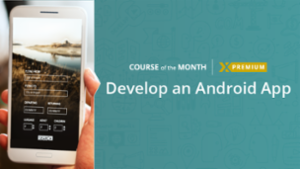 Preface: This article is part of a series focused on cross platform mobile app development (specifically Android and iOS) using the Alloy framework and Titanium Studio made by Appcelerator. This article presumes a working knowledge of Titanium Studio and the Alloy framework. The Alloy framework has great built in elements for making a simple menu, mainly using the TableView (and TableViewRow) system. Unfortunately this does not include any built in functionality for expanding and collapsing rows. 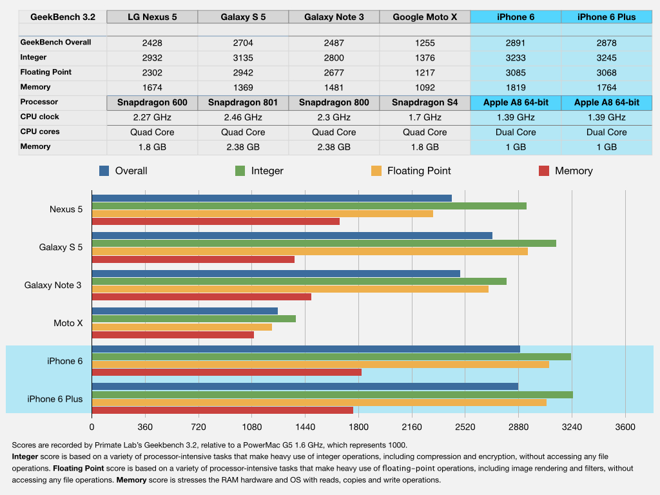 At first glance, using the "insertRowAfter" and "deleteRow" methods of the TableView would work for this. Unfortunately there seems to be a bug with the iOS implementation which leads to a "no row found for index" error when deleting rows. To avoid this error, the menu can be implemented as verticaly aligned View elements. In the menu View elements represent each row. The rows for the submenus start out "hidden" by a wrapper View with a height of 0. Each row of them menu that does not expand will have a "menuAction" property which will be harvested by the "menuClick" onClick listener. The parent row of each submenu will have extra properties which define how big the submenu is and the name of the submenu's wrapper View. If you are creating a mobile app that requires authentication before performing any actions you may need to present the user with a login form. You also likely want to save the user's information so that after authenticating they don't need to see the login form the next time the app is started. 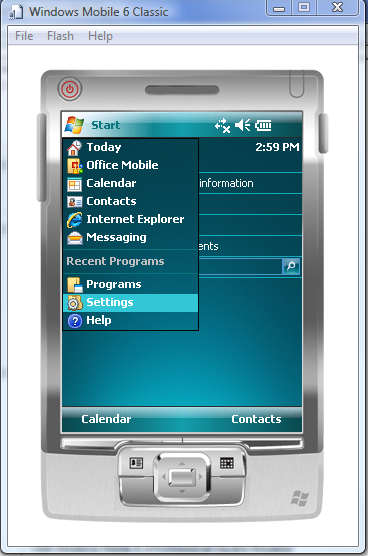 With Windows Embedded Handheld, called Windows Mobile, Microsoft re-designed the user interface. The Start Icon moved down to the bottom, inside the menu bar area. If you need to hide the Start Icon and/or the SIP (soft input panel, software keyboard button), you normally use the MS Mobile SDK SHFullscreen API. But this will not work for Windows Embedded Handheld! TextModeEnable controls the way the menu bar is drawn. O is for normal, graphic draw of the menu bar and 1 is used to define a text based draw of the menu bar. HardwareStartKeyEnabled controls the display of the Start Icon. HardwareDoneKeyEnabled controls the display of the (OK) button inside the menu bar. Now you can change HardwareStartKeyEnabled to 1 and the OS will think, the device has a hardware start button and does no more display an icon on the left of the menu bar. After you changed the registry key, all new windows will show without the start icon. Or, when you reboot, the start icon will not more being visible for any window or application. 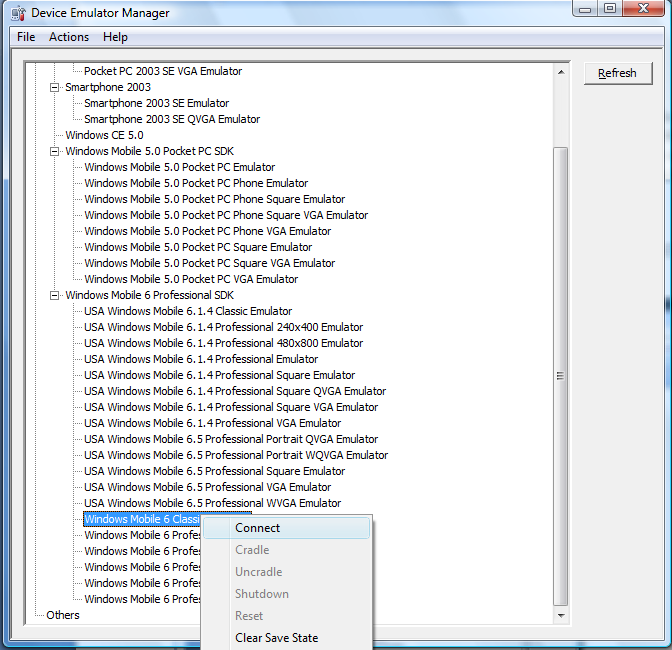 How to detect the name of the internal storage or an SD-card on Windows Mobile device from the desktop application? I got this question, when I was working on a PC application copying a huge amount of data on a storage card inserted into a Windows Mobile device (a phone in this case). I found the answer, very simple answer, but on my way I tested a few interesting ideas and I'd like to show them in this article. So the task is to copy a big amount of data to a storage (SD-card or an internal storage) of the device connected to the desktop. 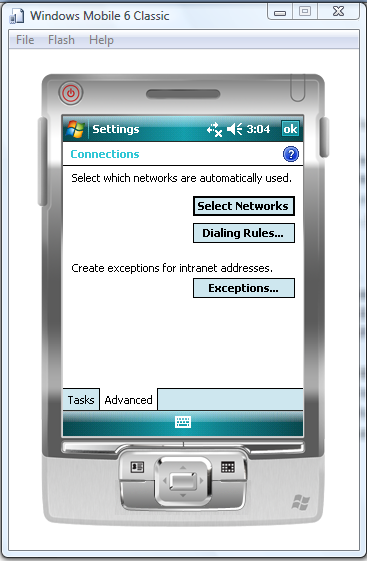 Both, the computer and the device, are running Windows - Mobile and XP or Vista. So, let's use RAPI. 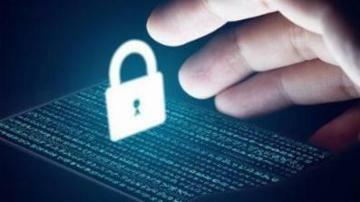 Remote API is a small set of functions that allows one to create or remove files, folders, registry keys on the windows mobile device connected to the PC via ActiveSync or Windows Device Mobile Center. Storage cards inserted into a device are usually shown in File Explorer as a folder named as "Storage Card" or "SD". 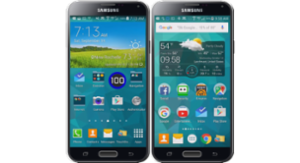 Internal storage may have name "Internal Storage" or "My Flash Disk" or "Resident Flash". 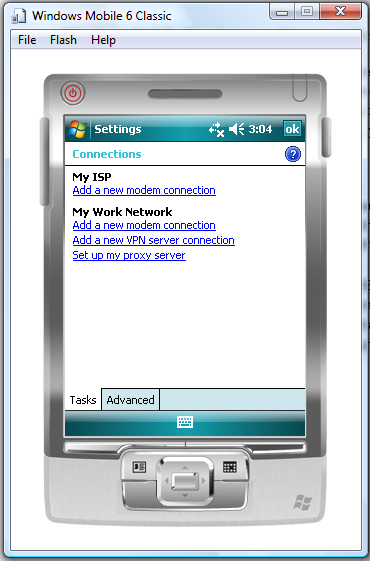 This article shows how to setup the internet connectivity on Windows Mobile Emulator. I assume that you already have Microsoft Visual Studio, Microsoft Windows Mobile SDK's and the emulator installed. 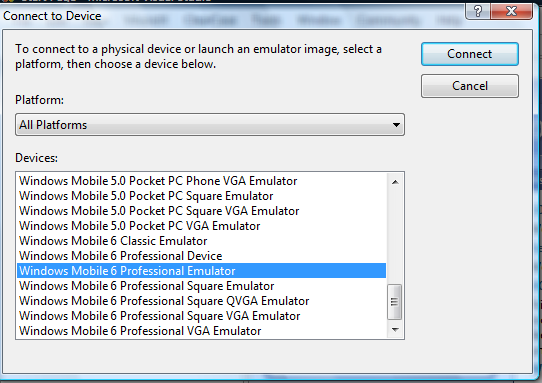 The emulator is available with Visual Studio or as a standalone (there is a link down the bottom). For a "clean" testing environment Install Microsoft Virtual PC 2007. See Virtual PC at http://go.microsoft.com/fwlink/?LinkId=78095 It really does make it easier to change network setting and that type of thing without affecting your day-to-day configuration. 2. 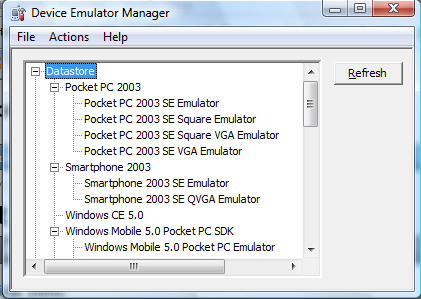 Launch Device Emulator Manager. 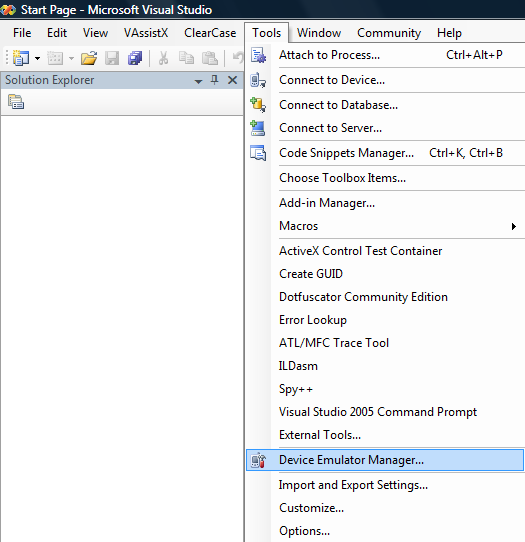 You can find "Device Emulator Manager..." in "Tool" menu. Click on the right mouse button will launch the manager. 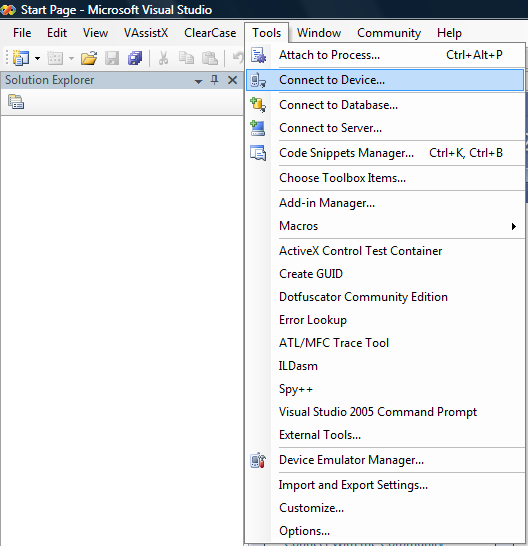 Note.Another way to start device emulator from Visual Studio is through "Connect To Device" item in the "Tools" menu. In the device list (Picture 3) you need to pick one and press "Connect" button (Picture 4). 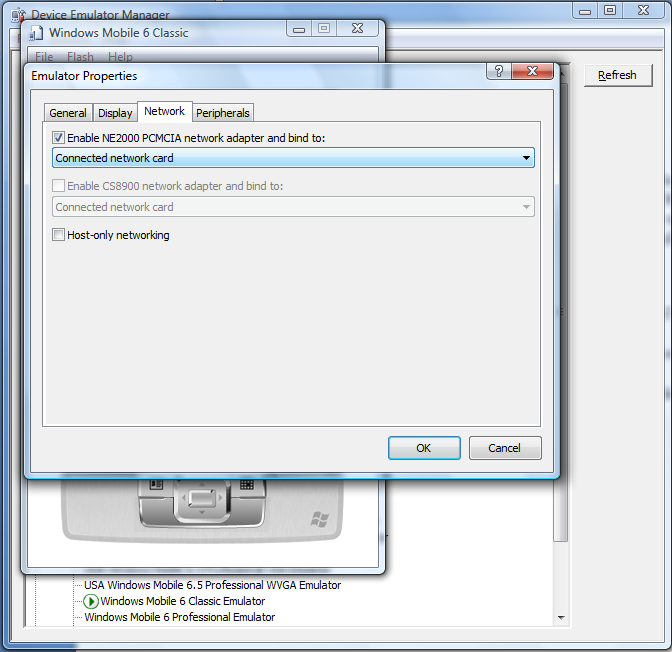 Enable NE2000 PCMCIA network adapter and bind to:". The combo box shows "Connected network card"
I am trying to set up Pocket PC WM 5 emulator on an XP SPack3 box. Virtual PC 2007 SP1 is installed. 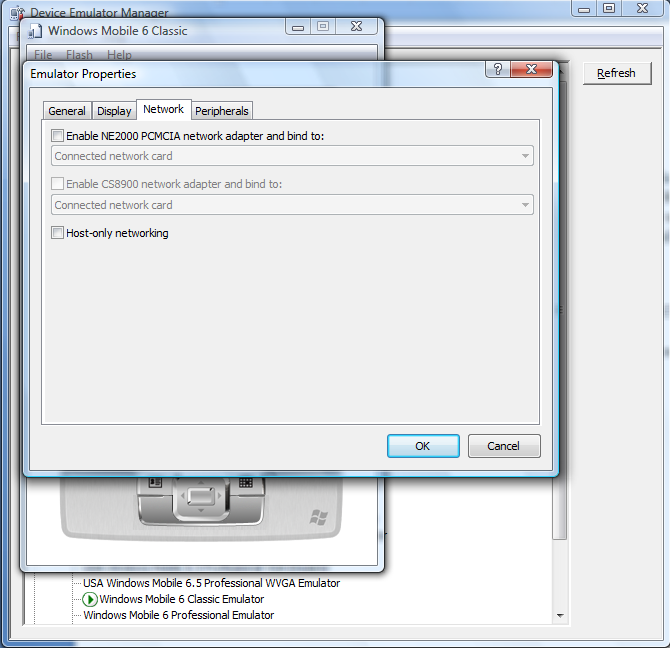 When I check the box "Enable NE2000 PCMCIA network", it does not stay checked. 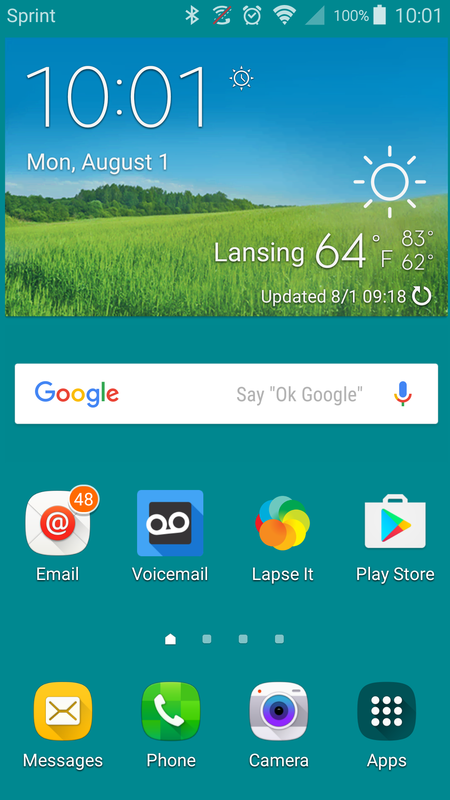 It clears immediately after I close that screen. How do I get it to stick? Can you please open a Question for this? 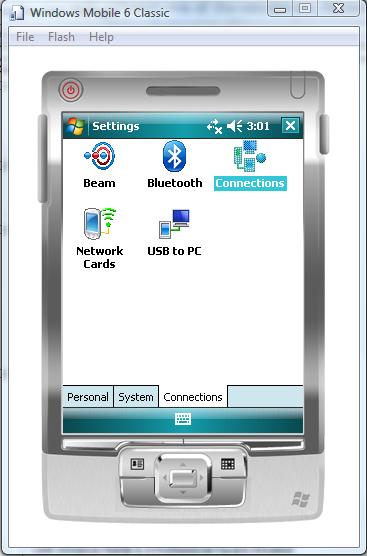 When I was a beginner in Windows Mobile programming, even for small test I used to create a single MFC dialog-based application with one button, and put my test code in the OnLButtonDown method. For Pocket PC it worked fine, on some Windows CE device that, sometimes, didn't have the MFC DLLs, this application even didn't start. For the first Microsoft Smartphones I needed to use another wizard, another resource file, special control compilation definitions, and so, many configurations. Now I know that it is unbelievably easy to make a small application without any GUI or just with a message box that can be compiled for any Microsoft Mobile or CE platform and simply works. 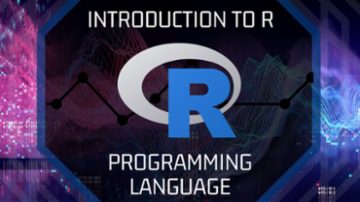 It allows me to be concentrated on the research or testing task and do not waste time on GUI arrangements, and project configurations compilation definitions, pre-compiled headers and other wizard generated stuff. 1. Begin a project in VS2005. 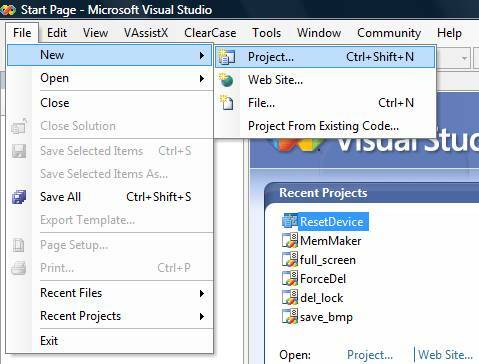 In Visual Studio, in the "File" menu choose "New" and then "Project..." (Picture 1). 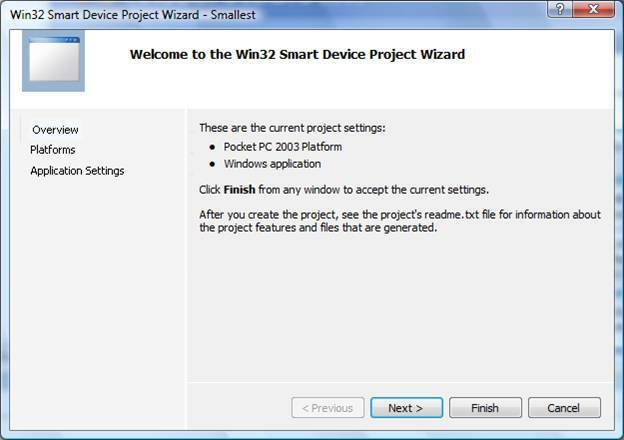 In the wizard, in Visual C++ section choose "Smart Device" item and on this page choose "Win32 Smart Device Project" (Picture 2). Set the solution name and press "Ok". 2. 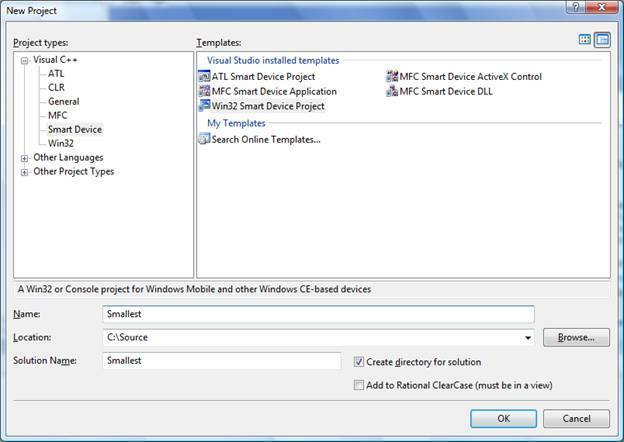 Smart Device Project Wizard. You see the standard wizard for the Smart Device project. Don't click on "Finish" - we need to change few default options (Picture 3). You have my vote above. I think the most popular question in our Windows Mobile Programming zone is about the backlight - we all want to keep it on when our application is running. Few years ago the function SystemIdleTimerReset() did this job. On our side we had to detect the device idle time and call this function appropriately. 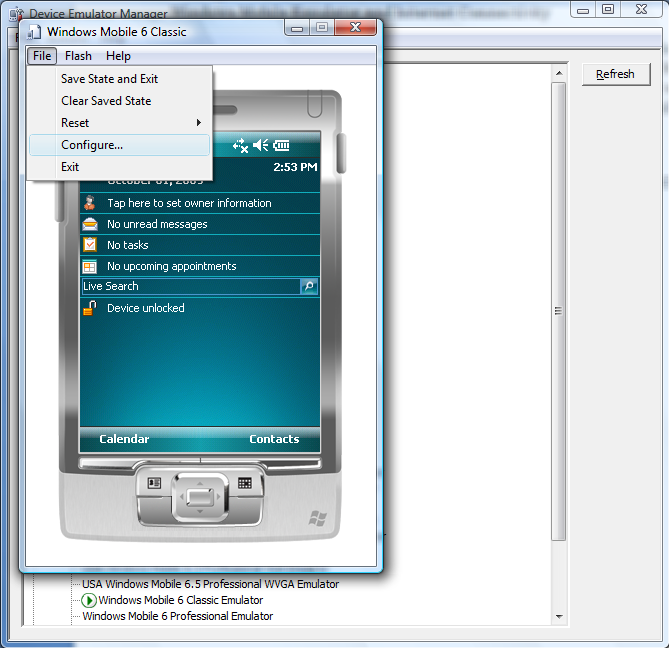 In Windows Mobile 6 this function keeps the system running, but the display is turned off. How to keep the backlight on? 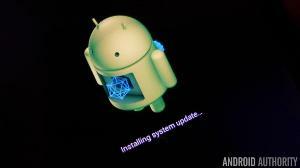 SystemIdleTimerReset() should be used also - this function keeps the device running. If you will forget about it, the display will be on, but the device will go to sleep together with your application. It looks like your application gets stuck. Articles when first submittted are regarded as "unverified" in so much as none of the Editors have seen it yet. As an article is worked on it should swap status between Editor Review and Author Review. As aikimark has already pointed out, it really was a message for him. Sorry for any confusion.